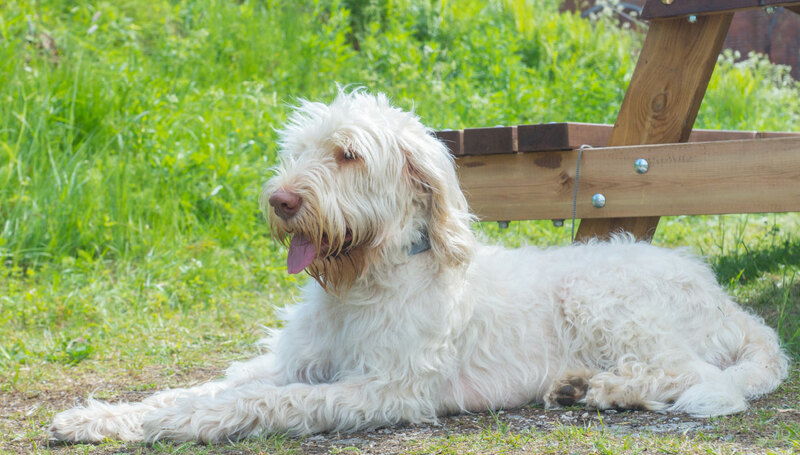 Many consider the Spinone Italiano the complete package—a well-behaved, playful family dog who can also accompany hunters into the field and hikers on the trail. They're rarely short on energy, but most know when to take advantage of a bit of downtime and will curl up on the couch for a nap. Though they are friendly, intelligent and easygoing, this breed isn't an ideal first-time dog. They require a consistent owner who will not relinquish the position as leader of the pack. Spinoni are incredibly patient, kind without fail, and clownish—which may be used as a tactic to get them out of a scolding, usually with great success. Spinone Italiano are also called Italian Spinone, Italian Griffon, and Italian Wirehaired Pointer, or Spinone. The pronunciation is Spee-no-nay, and the plural is Spinoni Italiani or Spinoni (Spee-no-nee). Coat - The Spinone has a dense, wiry single 1½- to 2½-inch long coat with stiff hair on the eyebrows, cheeks, and muzzle. Accepted coloring includes white, white and orange, orange roan, or white and brown. The Spinone Italiano has been bred as a hunting companion for centuries, and is one of the oldest breeds to be used as a gundog. Dogs listed in records from as far back as 500 BC match the description of the Spinone, and the type appears in 14th- to 15th-century artwork. Though the origin of the breed is unknown, one popular theory holds that the breed was developed from ancient Celtic wirehaired dogs. A more likely origin story is that Spinoni were developed from dogs brought to Italy by Greek traders during the Roman Empire. Italian Spinoni are said to have been named for their ability to break through thorny bushes, and were possibly named for the Italian spino, a thorny bush. The first pair of Spinoni came to America early in 1931. World War II and a shift in favored hunting breeds contributed to a decline in population. Spinoni fanciers worked to build up the numbers, which included some cross-breeding with wirehaired sporting breeds. Though Spinoni had been shown in the Miscellaneous Class at dog shows beginning in 1932, it wasn't until the year 2000 that the AKC recognized the Spinone Italiano as a breed. Patient, loving, and often playful with family, Spinoni are an even-tempered breed with a sweet nature. Though they may be hesitant with new people, well-socialized Spinoni will warm up quickly. If their high level of energy is not given an appropriate outlet, they may resort to destructive or rambunctious behavior. They can be couch potatoes and often enjoy stretching out on the furniture for a good nap. Are Spinoni Italiani Good with Kids? Though no child should be left unsupervised with any dog for any amount of time, Spinoni are gentle, friendly, and patient with children and often do well with kids of all ages. Are Spinoni Italiani Good with Other Pets? Households with other pets—both dogs and cats—are often fine for Spinoni, but their high prey drive means they may chase cats as a form of entertainment. Birds and small animals like rats and hamsters aren't ideal, as the Spinoe may injure or kill them. Though the loyal Spinone Italiano may bark at the approach of a stranger, they do not possess a strong guarding instinct. They will alert you to newcomers but are far too friendly to act as guard dogs. Spinoni are sporting dogs that need plenty of exercise and have a moderate energy level. Indoor With enough exercise, Spinoni can be calm and relaxed indoors, a docile dog happy to spend time with family. Because they are a hunting breed with the need to run, an apartment is not an ideal living situation for the Spinone, nor is this an ideal breed for people who prefer a spotless home—they may slobber and drool, and the wiry, single-coated breed will shed year-round. Outdoor Though the Spinoni's wiry, dense coat is made to stand up to the weather, the breed should not be expected to live outdoors, or be left out without supervision. They are a sensitive, people-oriented breed, and are meant to live inside with family. Without enough attention, they may dig under—or jump over—fences. They have a high prey drive, so neighborhood cats and wild animals and birds will be tempting for Spinoni. Exercise This hunting breed needs daily walks and the opportunity to run, either on leash or in a fenced area. Without enough exercise, they may become destructive or obstinate. Endurance The Spinone Italiano is definitely not lacking when it comes to stamina. This breed has the endurance for a full day in the field, or to keep up with active owners. Running Miles: Full-grown Spinoni in good health may be able to run for five miles or more. Hiking Miles: A full day on the trail is often easy for the tireless Spinone Italiano. Their high prey drive may require they stay on-leash, unless their off-leash manners are impeccable. Food Spinoni usually need about 2 to 3 cups of good quality dry dog food each day, split between two meals. This amount is based on average activity level and weight. They may suffer from gastric torsion or bloat. Raising the food bowl and limiting activity for an hour after eating can help prevent this dangerous condition. Spinoni Italiani do not tend to guard their food more than any other breed, but children should never be allowed to touch or remove food while any dog is eating. Alone Time Bored dogs may become destructive, but with enough mental and physical stimulation, the Italian Spinone may be able to stay alone for five to eight hours per day. Crate training may be necessary to prevent destructive behaviors when left alone. The wiry coat of the Spinone doesn't require excessive grooming—occasional brushing, hand-stripping as necessary, and bathing bi-weekly to monthly will keep this breed's coat and skin in top condition. Regular trimming is not necessary—and because it may alter the texture of the coat, it is not recommended. Trimming nails regularly will help prevent painful splitting, cracking, or a broken nail. You can minimize serious health concerns in a Spinone Italiano by purchasing him from a reputable breeder who engages in responsible breeding practices, and through screening for common diseases and conditions. With consistent training using positive reinforcement techniques, Spinoni learn quickly. They may have a bit of a stubborn streak and may be easily distracted, but they're generally an eager-to-please, easy-to-train breed. Fun lessons during everyday activities are the best way to earn a well-behaved Spinone—the less it feels like training, the more the Spinone will cooperate. Goofy antics may ensue during training, so a balance between firmness and allowing for the breed's playfulness is important. Advanced training can help give the Spinone the mental and physical stimulation it needs to be happy and well-behaved. Spinoni love spending as much time as possible with their people, so the extra bonding provided by advanced training will be well-received. Agility, tracking, rally, dock diving, and other dog sports are favorites of Spinoni and their owners. The Spinoni has a hunting history that spans centuries, and though they've become more common as a companion than a hunting dog in the United States, they are still good candidates for sporting dog training. This is a ready-to-work dog who thrives with a job to do. They are fantastic swimmers, will retrieve on land or water, and have a keen nose for tracking. Though Spinoni aren't the most speedy hunting breed, they are fantastic hunting companions. They also perform well in field and hunting trials. Spinone Italiano may suffer from cerebellar ataxia, a neurological disease that affects the motor center of the brain. The condition usually presents by four months of age—symptoms include an abnormal gait, loss of coordination, and poor balance. The disease is progressive and symptoms will worsen throughout the first year of life. There is no treatment for this heritable disease and the condition is fatal, usually within the first year. The disease is inherited when both parents pass a copy of the mutated gene—if only one parent passes the gene, the offspring will be carriers but will not present clinical signs of disease. A DNA test is available to determine if dogs are carriers—results come back as clear, carrier, or affected. Spinoni who test 'clear' may be bred, and carriers may also be bred—but only with dogs who have tested clear. While breeding carriers of this gene is discouraged, pairings of a carrier and a clear dog will produce an average of 50% carrier and 50% clear offspring—because only one copy of the gene passes they will not produce 'affected' offspring. Affected dogs should never be bred. No. Although the Italian Spinone is a wiry-haired, single-coated breed, they shed moderately and produce dander. Saliva and dander are common allergens, and Spinoni have plenty of both. Their shaggy coat may also drag in debris from the outdoors.